Full confession: I must be a bad nerd, because I do not remember this character at all. 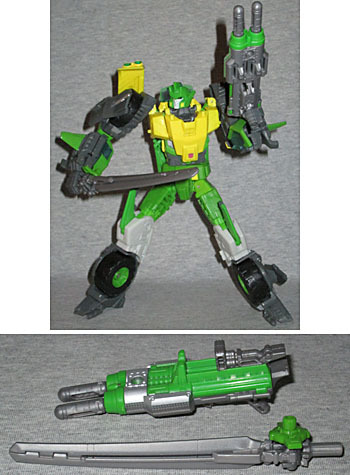 Springer is a Generation 1 character (duh), and the fans always seem to be excited when he gets a new toy. But I legitimately don't recall his existence at all. But hey, nobody ever said "getting NECA'd" could only apply to one company. Autobot Springer was built to be a tough guy. Everything about him, from his nickel-plated blaster cannon to his bad-boy attitude, is calculated to communicate exactly what he wants it to. He's a no-holds-barred, take-no-prisoners kind of guy. But it's not just attitude. Autobot Springer really is everything he appears to be. The Decepticons fear him, and the other Autobots just stay out of his way. He prefers to fight alone, trusting his skills and luck to get him out of tight spots, rather than relying on his fellow warriors. After all, other Autobots fail. Autobot Springer never does. 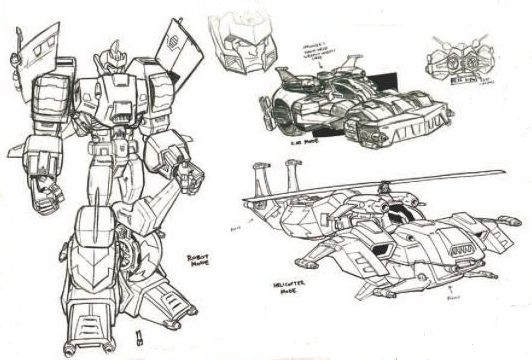 Springer is based on the designs of artist Nick Roche, just like Blitzwing was. Looking at the original toy, the head shows a lot of animated influence: he has a winged crest on his forehead, large squares by the cheeks, and a metal mohawk over the top of the head. He also has flares pointing back past the ears - a new feature unique to him. Springer is a very large robot, but not particularly bulky. He's 6⅞" tall, but mostly skinny. He gets his name because he has the ability to jump really well - seriously, it's on his original Tech Specs - and having long legs with a lot of front-to-back bulk makes that look possible. The kibble on his arms adds bulk to the upper and lower arms, while leaving the elbows thin. 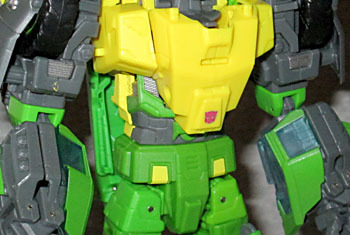 Two plates of armor rise up over his shoulders, and his chest is yellow and much more angular than the G1 figure's big flat plate. It all comes very close to matching the source artwork. 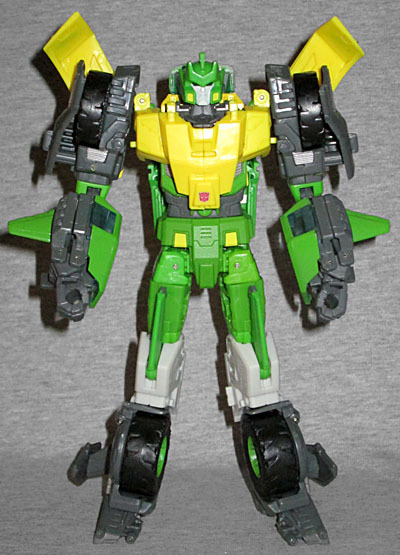 Springer has a balljointed head, hinged and swivel shoulders, swivel biceps, hinged elbows, swivel wrists, swivel waist, swivel/hinge hips, swivel thighs, and hinged knees. The joints are all stiff enough to hold position. He's armed with a friction-powered missile launcher, and a 4¾" sword. The launcher is kind of neat: though it has two projectiles, they fire one at a time as you slide the lever forward. Thanks to an abundance of pegs and holes, you can even combine the two weapons if you want, or plug one into his back for storage. I may not know anything about Springer, but I do know good toys; Springer is a good toy. The robot mode is excellent, and both altmodes manage to look unique, yet related. How good is Springer? Well, you know how I feel about double-dipping on molds, and yet I'm still going to pick up Springer's repaint, Sandstorm, at some point. That should tell you all you need to know.